Keeping a nonprofit afloat can be kind of like feeding a snake. Snakes tend to eat a big meal and then survive off that food for days before they find another one. Nonprofits often rely on a few big fundraising campaigns or events that bring in a large portion of its capital. In between those feasts, however, there is often famine. One event may raise lots of money but the next month may leave you in the red. It can be less stressful and easier to plan ahead when you have a steady flow of reliable income. Fortunately, most organizations have monthly giving programs to help, but the lack of recurring revenue continues to plague and hinder many organizations. One solution that is becoming more popular and easier to implement is having a year-round fundraising team. In other words, more and more nonprofits are empowering their supporters to create fundraising pages and campaigns in conjunction with their own life events. Not only does this create a steadier stream of revenue for your organization, but it builds a strong community of supporters who can grow and expand your programs in the long-term! Over the past year, Action Against Hunger has built a strong community of fundraisers they call #Team45. Let’s take a look at how they were able to use peer-to-peer fundraising to raise tens of thousands of dollars. We’ll check out some of the key steps they’ve taken to create a year-round fundraising machine. Fundraising – Front and Center! What is your most prominent call-to-action? In all likelihood, it’s a “Donate” button. And that’s fine for many web pages. But if you want to create a community of year-round fundraisers, the focus should be on fundraising. 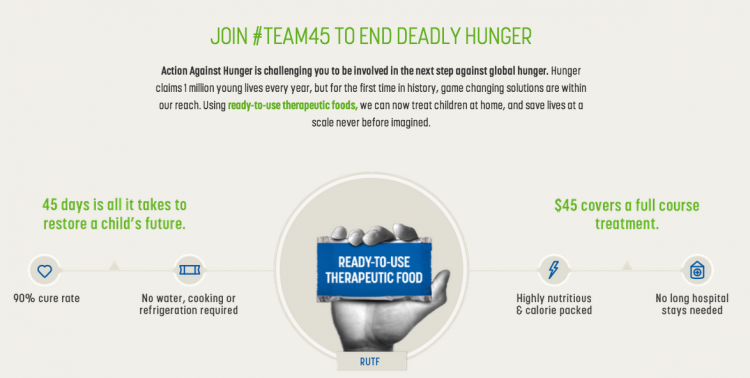 Let’s look at Action Against Hunger’s microsite for Team 45, with the CTAs blurred. If you had to guess, where would you think you’re supposed to click to start fundraising? Now, let’s take a look at the page again. Were you right? You’ll see in the top right corner that the two calls-to-action are “Start a Campaign” and “Donate.” The above image is a screenshot of the page after you scroll down some and come to a larger version of those CTAs. What makes this microsite different from most nonprofit pages seeking to engage supporters is that the “Start Your Own Campaign” button is clearly the preferred CTA. On most nonprofit websites, the fundraising CTA looks like an afterthought, if it even exists. Some don’t even have a “Fundraise” button, and visitors would have to go looking through the “Get Involved” tab to find out that is an option. It may sound simple, but putting the fundraising CTA on the left (where people begin reading) and making it a brighter color subtly influences the audience to favor that option. 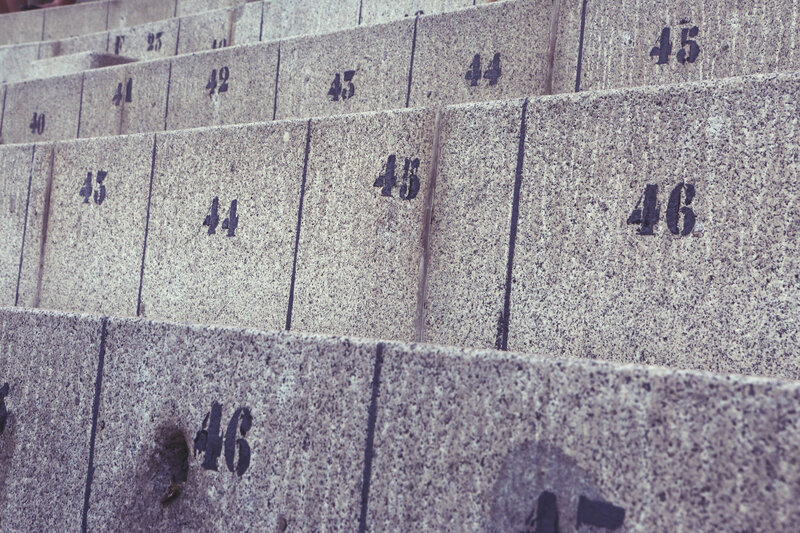 One of the first rules of creating CTAs that convert is to make them stand out on the page. Without even reading the copy, the viewer should know where you want them to click. As long as you still include a visible “Donate” button, putting a spotlight on fundraising shouldn’t cause you to lose out on the people who just want to make a donation. Most people will be able to fundraise more for your cause than they could personally donate, which is why peer-to-peer fundraising can be so effective. When creating a year-round fundraising team, don’t be afraid to make the “Fundraise” button the most eye-catching, clickable CTA. Action Against Hunger didn’t just remind their audience that they can make a fundraising page, the organization created a team and brand that supporters can be a part of. Team 45 does a great job of giving special distinction to peer-to-peer fundraisers while making it clear this is a place anyone can come to help. Within 30 seconds of reaching the page, you know what #Team45 is. The name itself is smart, in that it automatically reminds you how a small investment can rescue a child from the brink of starvation. If your goal is to recruit fundraisers, it makes sense to speak directly to them. 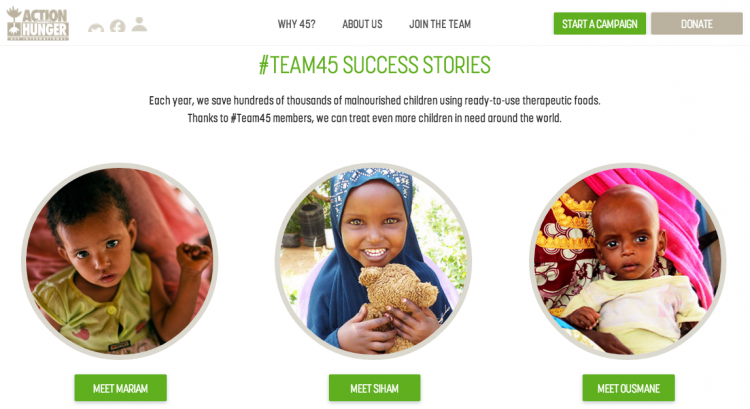 While the #Team45 microsite includes video and pictures of the children they serve, it is clear that this page is addressing the audience of potential fundraisers. The page is full of empowering language that invokes the reader’s ability to help. The #Team45 webpage goes on to highlight the people already fundraising and offer lots of different ways to create a campaign. Another step Action Against Hunger took to set themselves up for success was to give the audience helpful tips to running a campaign. They even offer a fundraising guide that walks you through the process, step-by-step. A key component to building a year-round fundraising team is to encourage, aid, and celebrate your fundraisers. Action Against Hunger does all this on one clean, well-designed page. As the term “year-round fundraising” would suggest, the goal of an initiative like #Team45 is to provide continuous financial support to an organization. But when something is available all the time, it runs the risk of losing the urgency and motivation fundraising requires. Action Against Hunger also features the stories of children they have helped alongside their progress bar. While fundraisers set their own goals, they are also contributing to the team’s overall goal. This flexibility brings a unity of purpose even as fundraisers have full power over their own commitment. Working to build a year-round fundraising team is a smart move for most nonprofits because it not only brings in donations, but brings in new donors too. The peer-to-peer fundraising option empowers supporters to do more by reaching out to their own network. As you consider starting or strengthening your own year-round fundraising team, examine whether your program could benefit from any of these best practices from Action Against Hunger.